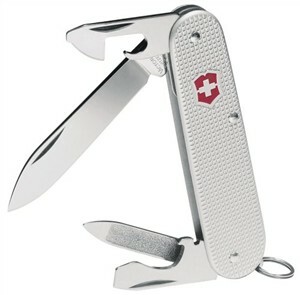 Only a little more than half as thick as the same knife built with stainless steel liners and cellidor handle slabs, the Silver Alox version of the Swiss Army Cadet carries the same set of useful blades. If you need a knife that's practical for the office or for class, the Cadet provides appropriate functions and the traditional multi-purpose cutter. The 3-1/4-inch-long Silver Alox Cadet saves on weight and space by combining the function of liners and handle slabs. The silver alox ribbed panels serve both purposes and greatly streamline the package. The knife will ride in a pants pocket without the usual lumpy silhouette. In addition to the high carbon stainless steel spear point blade, the Silver Alox Cadet knife holds separate bottle and can opener blades and a nail file. A notch on the bottle opener blade strips electrical insulation from small wires, and the blade's tip works well as a flathead screwdriver for large screws. The tip of the can opener blade will handle the smaller ones. The Cadet's key ring works equally well for holding the car keys or a lanyard. If you equip it with a lanyard, you'll find it more easily in either pocket or purse. One side panel of the Silver Cadet from Victorinox includes a polished engraving panel 1/4-inch by 3/4-inch long, in case you'd like to personalize the Cadet -- a nice touch to complement a nice gift. For a larger version of this excellent knife with a slightly different assortment of tools, see the Swiss Army Soldier -- still the Swiss Army's official pocketknife.